Place the banana into a dish. Melt the chocolate in a saucepan on a low heat (or in a microwave oven) and pour over the banana. Then sprinkle with 100's and 1,000's. Serve with ice cream if if you like. 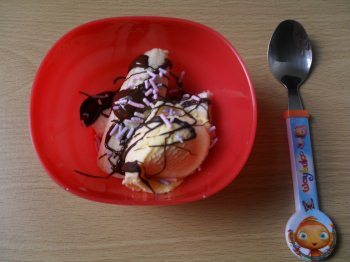 So this is reaaly quick toddler dessert that can be made in a matter of minutes. So why just settle how premade store bought desserts. You know exactly what went into making this. If you're like me then you too have no idea what some of the ingredients are that are listed on the food packaging. Some of the ingredients sound more like they belong in a laboratory rather than food we give our kids. This is a super easy dessert and kids just love them. Great for a special treat but not every day. This is one of many toddler desserts you will find on this website.